Spherical shape covers furniture corners from all angles. Highly elastic materials isolate the sharp spot and absorb impact. Keeping Your children away from bumps, bruises and painful injuries with those furniture corners. Preventing furniture corners from damage and scratches when moving it around. All of our corner protectors are equipped with of pre-applied adhesive designed exclusively for furniture surface. The major sticking power ensures your corner protectors to stay tight and long right on spot! The non-hardening feature makes it easy to remove without leaving residue or damaging your furniture by any means. Transparency appearance and portable size help blend in your home design. Fits all sharp corners on your regular furniture including Kitchen Counters, Desk, Coffee Table, Cabinets, Chairs, and Bedstead. The product can be directly contacted with food. Safe for children. For any question of this item, please feel free to contact our customer service. Please make sure your order is sold by Slegan. 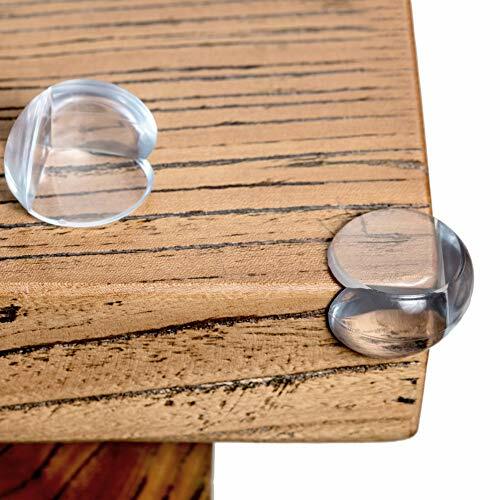 HOME DESIGN SPECIALIST - Slegan designs its corner protectors in ways that effectively prevent you and your child from injuries by the sharp corners at home as well as preserve your furniture appearance so that your home design is NOT affected. EXCLUSIVE ADHESIVE - Each protector contains the total of 3 pieces of gel adhesive with each piece attached to one inner surface of the protector to give your massive sticking power and stableness. EASY SET-UP - Requires 3-5 minutes to set up your one and only home corner protector. PRODUCT SAFETY - The product is tested under official US regulations. All materials are classified as non-toxic medical grade PVC. No harming chemical substance. Adult's supervision is recommended for the use of the product. If you have any questions about this product by Slegan, contact us by completing and submitting the form below. If you are looking for a specif part number, please include it with your message.